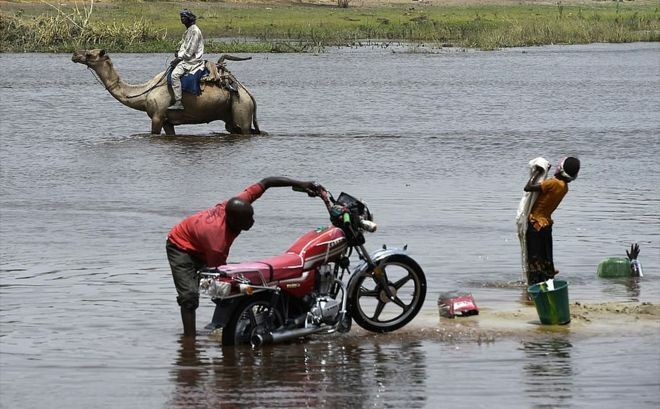 Lake Chad: Can the vanishing lake be saved? Lake Chad – a source of water to millions of people in West Africa – has shrunk by nine-tenths due to climate change, population growth and irrigation. But can a scheme dating back to the 1980s save it? “It’s a ridiculous plan and it will never happen.” That’s the reaction many people have to the idea of trying to fill up Lake Chad and restore it to its former ocean-like glory by diverting water from the Congo river system 2,400km (1,500 miles) away. Sceptics in Nigeria, who have seen successive governments fail even to make the lights work, wonder if the region’s politicians have nodded off and have been dreaming a little too hard. But the government ministers and engineers who were recently sipping mineral water in the capital, Abuja, at the International Conference on Lake Chad had good reason to be thinking outside the box. 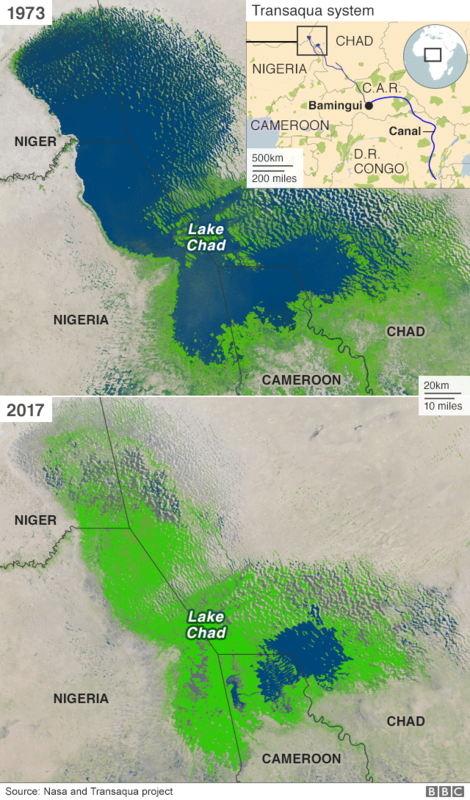 Lake Chad has shrunk by 90% since the 1960s, due to climate change, an increase in the population and unplanned irrigation. Its basin covers parts of Nigeria, Niger, Chad and Cameroon, and has been a water source for between 20 million and 30 million people. But with the desert encroaching further every year, it is getting increasingly difficult for families to make a living through agriculture, fishing and livestock farming. 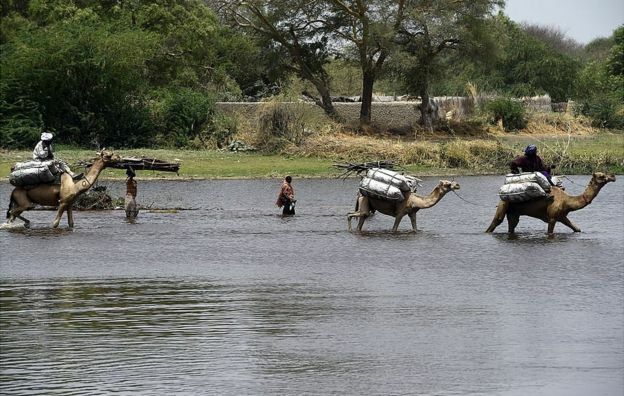 The UN says 10.7 million people in the Lake Chad basin need humanitarian relief to survive. “We used to pass fields of maize on our way to the lake and there were vast numbers of boats bobbing up and down on the water back then, and huge fish markets,” says Bale Bura, who grew up by the lake in the 1970s and now works for the Lake Chad Fishermen’s Association. Now far fewer farmers are able to earn a living on the mineral-rich but bone-dry shores. This is one reason why the delegates in Abuja decided to dust off a scheme first mooted back in 1982 by the Italian engineering company Bonifica Spa. It came up with Transaqua – a plan to construct a 2,400km (1,500 mile) canal to transfer water from the upstream tributaries of the mighty Congo River all the way to the Chari River basin, which feeds Lake Chad. It proposed the transfer of up to 100 billion cubic metres (3.5 trillion cubic feet) of water a year and featured a series of dams along the route to generate electricity. “I sent one of our engineers to the USA, to purchase the only reliable maps of Africa, which were made by the US Air Force and were the only maps with contour lines,” says Marcello Vichi, the Italian engineer who was asked to look into the idea during the early 1980s. He says 500 copies of the plans were sent out in 1985 to government representatives of every African country, as well as international financial agencies. “The response was a deafening silence,” he adds. But more than three decades later, minds are finally focusing on the lake’s shrinkage, prompted by its link to the deadly geopolitical crises of Islamist militancy and migration. In 2014, I headed out of the north-east Nigerian city of Maiduguri towards Lake Chad in a new minibus. There were armoured vehicles in front as well as behind, and right next to me was a Nigerian soldier – fast asleep. Our destination was Kirenawa, the latest village that the marauding Boko Haram jihadists had terrorised. As the road became steadily sandier, we entered a long-neglected area, passing the faded signs of abandoned government projects in ever hotter and sleepier villages. Buildings had been torched and people had been left terrified, watching as others were killed in front of them. In all the villages, people complained there was nothing for young people to do, nothing to dream of except getting out. It had become a perfect recruiting ground for the Islamist militants. The offer of a little cash and the promise of some training and a gun persuaded many to join. Of course, Lake Chad’s decline is not the sole reason for the rise of violent extremism – a number of factors including poor governance have also played a role – but there is clearly a link. “I know many young people from my own village who got into these ugly kinds of jobs,” Mr Bura says. 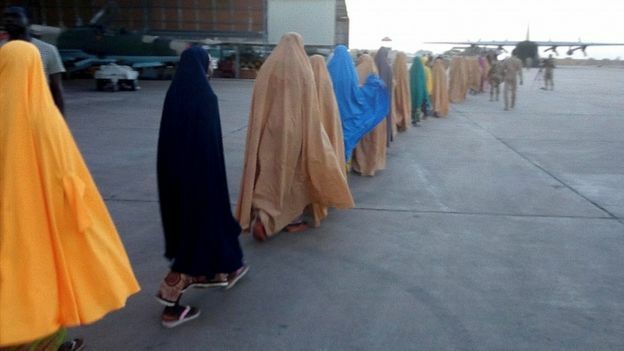 As if the delegates gathering in Abuja last month needed reminding of how dire the security situation had become, more than 100 schoolgirls had just been seized from Dapchi, Nigeria. At the meeting, it was agreed that Bonifica and PowerChina, the company that helped build the Three Gorges dam spanning the Yangtze River, would complete a feasibility study. They announced that the effort to raise $50bn (£35bn) for the Lake Chad Fund should begin immediately. 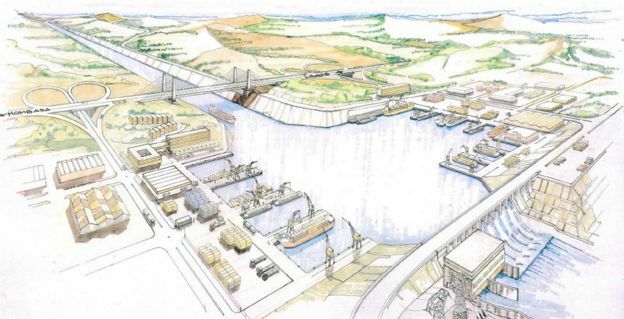 Bonifica says its plan will use less than 8% of the water the Congo River discharges into the Atlantic and would not be a threat to the Democratic Republic of Congo’s continuing Grand Inga Dam project, which would create the world’s largest hydropower generator if it is completed. Further engineering work would be needed to enable the Chari River to handle the increased flow of water. The project can be done in a staggered way, with each completed stage immediately adding to the flow of water into the Lake Chad basin. Other options that have been considered include one which involves pumping the water uphill from Palambo, in the Central African Republic. As well as the funding challenge for Transaqua, there will be resistance from environmental campaigners to overcome. And even carrying out the feasibility study properly requires peace. Chinese media has reported the transfer canal would be 100m (328ft) wide and 10m (33ft) deep and would be flanked by a service road and eventually a rail line. “It is a project which responds to the never-tackled infrastructural needs of the African continent, which maybe will give birth to a real African renaissance,” says Mr Vichi, who sees all along the route of the canal vast potential for agro-processing and transforming agricultural products for African and foreign markets. Ministers know life is likely to get ever tougher for the people who live around Lake Chad. That’s why they are paying attention to the plans to bring it back to life. This entry was posted in Africa, Health, History, Science, Travel, World and tagged Africaè, News, Science, Travel by rolyred. Bookmark the permalink.